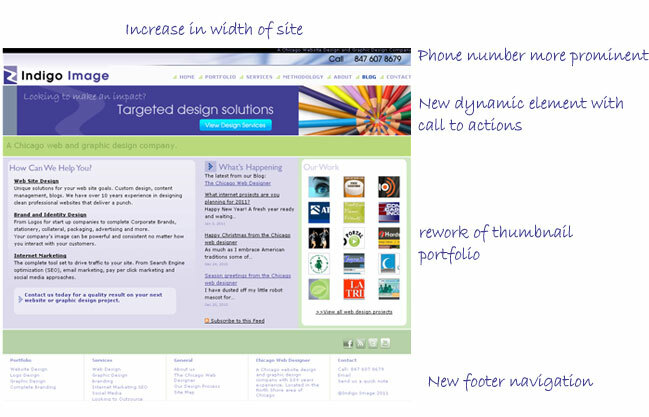 Can your website accommodate changes in your business? When designing and developing a web site this is an important consideration. Your web site needs to be able to easily change and grow with you without going back to the drawing board. We practice what we preach with our own website and launched today is a mini overhaul of our site. There is no major redesign just a few tweaks here and there to better serve our visitors and behind the scenes some updates for the search engines to reflect our new Chicago location. We have added a couple of new pages detailing our branding and social media services. The entire updates were done very quickly thanks to the way the site is coded. For most of the changes we needed just a few lines of code switched out in the style sheet. ← What internet projects are you planning for 2011?